Editor’s note: Ben Narasin is president of TriplePoint Ventures and Michael Abbott is General Partner at Kleiner Perkins Caufield & Byers. In a prior era, some considered it best practice to bring in “professional managers” to run the businesses started by creative and hard-working entrepreneurs once those business began to scale and appeared to need “adult supervision.” The term “upgrade management” is still occasionally heard among investors but never in front of founders. Over a recent breakfast, we talked about the infuriating and callous nature of this concept and our shared belief that it was actually counter-productive to the building of world-class businesses in our modern age of entrepreneurship. We spent breakfast talking about the importance of founders, the moral authority that they bring to the business and the rarity of outsize success without them. This raised the question of whether the data would prove out our opinions, or prove the old guard actually had a point. That breakfast set us on the quest to find and analyze the data and write this story. It led us to confirm and reaffirm the importance of founders. Recognizing the limitations of using an empirical approach to model an inherently qualitative issue we want to be formal about the dataset we used. We searched data on any IPOs or M&A exits between 1994 and 2014 and generated 1,195 financings across 894 companies. Several companies were sold multiple times, as in the case of About.com or CareerBuilder, both of which were acquired more than three times, so we excluded duplicate counts where possible in our final results. We generated a binary indicator – 1 if the company’s CEO was also one of the founders at the time of IPO or acquisition, 0 otherwise. The scatter plot below charts the amount of venture and debt capital raised by companies on a logarithmic scale, and their corresponding valuations at the time of the IPO or acquisition. Founder-led companies are in red and others in blue. We then looked at average valuations, capital raised, and value (the difference between capital raised and valuation at the time of IPO/M&A) for companies led by founders versus professional managers. 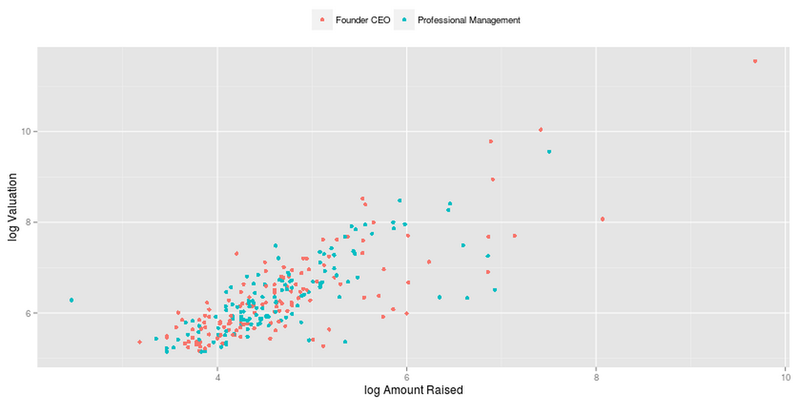 Founder CEOs raised more capital on average than professional managers, and produced higher valuations. Where they really shone, however, was in creating ‘value’ – the difference between capital raised and valuation. Value created was more than double for founder-CEO led companies than those led by professional managers. This also holds true for IPOs, where founder-CEOs raised more capital and produced higher valuations and value than their non-founder counterparts. Companies led by non-founder CEOs were associated with marginally higher valuations and value when we looked only at M&A events. Perhaps the right conclusion is that it’s less crazy to replace founders when the outcome being driven to is an outright acquisition, where the mean value is lower than the total capital raised. This might even seem intuitive, given that acquisitions can sometimes be ways for great teams to exit a poorly run company, and that professional managers are better with these last-ditch scenarios. Being a founder can take a zealot’s level of commitment, and if that vision is no longer achievable, it may be hard to impossible for a founder to abandon his beliefs and move to an exit that does not fulfill their dreams. A professional manager can navigate the waters without the emotional baggage and commitment of the “all or nothing” founder. We’ve certainly heard stories of professionals brought in to “put lipstick on a pig” and get a company sold, but these are down-side management scenarios. What drew us to the question though, and what the data appears to prove, are the upside versions; the big wins. The data show what our experience told us; replacing founders to pursue a big dream is lower-odds methodology and should be treated as a nuclear option. It should be a rare and exceptional thing when all other possibilities have been exhausted. Once in a while, it does make sense when the original founders believe that the best way forward is to partner (the key word here being “partner”) with someone who complements their leadership. Most instances, however, do not end up being high-functioning partnerships like Jerry/Filo/Koogle or Larry/Sergey/Schmidt, but it can be painfully common to hear about founders who get forced out or replaced by their board or investors. We get up in the morning to help bold entrepreneurs build world-changing companies that are often highly valued by other companies and public market investors. If these are the companies that most venture capitalists want to back, then the data would point in favor of letting founder CEOs lead the companies they work so hard to build. 4. Amazon Turk – to fill in gaps, and clean data we had two separate sets of Turks run down the entire data set independently so that we had a double-blind error-check.